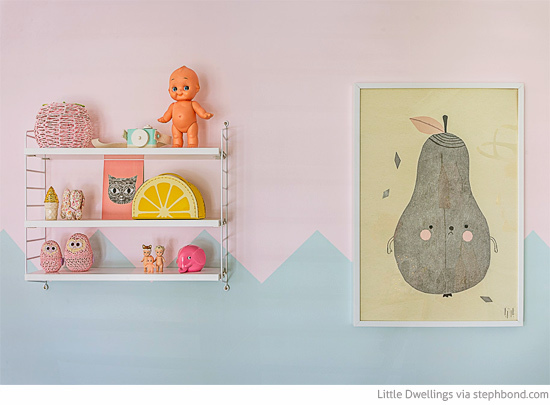 My daughter has mint-painted walls in her bedroom and I tell you, it has not been an easy task for me to pull together her room. 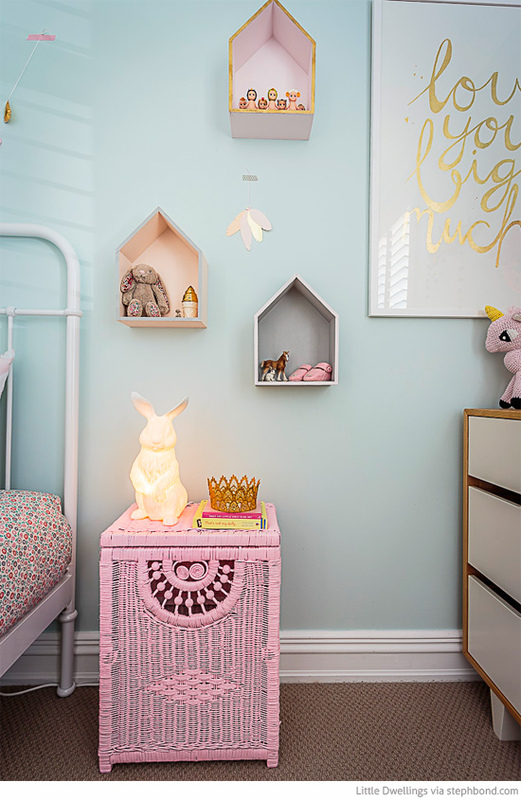 Luckily, I can take inspiration from Sydney children's interior designer Kate Sparks of Little Dwellings who shares her daughter Georgia's room, below. Kate makes mint sing - in fact, the room would not be nearly as cute with white walls. It's the soft pastel palette that works so beautifully with Georgia's mint walls - pink, gold and grey grounded by the white bed, dresser front, wall trims, shutters and large artwork. Owls: Handmade and purchased from the hospital gift shop at the SAN. Kate was so excited to have a little girl that she went straight down to the gift shop and had to have them. Isn't this dresser gorgeous - a beautiful piece that will grow with Kate's daughter as her style and tastes change over the years. 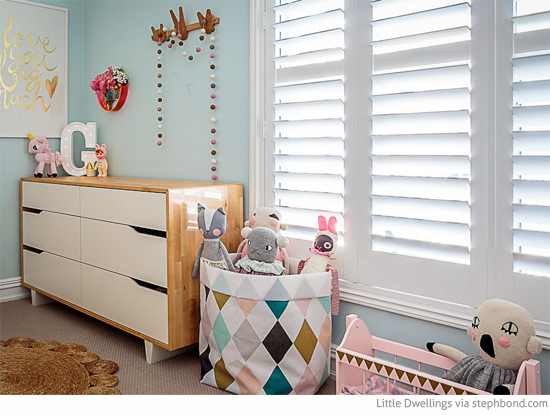 It looks great with the Armadillo & Co Daisy rug, now an Aussie kids' room classic. Toy cradle: Kate's own toy cradle as a child that needed some TLC. She painted it soft pink with gold triangle detail. Top Knot Designs will be making one similar (keep an eye on their Instagram feed for details). 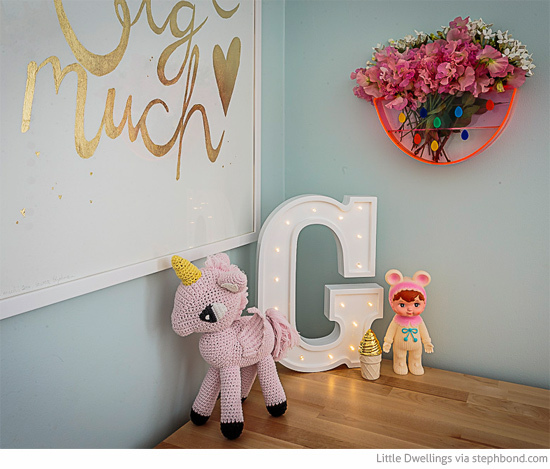 I especially love the Australian goodies in the sweet vignette - the Lovestar neon watermelon vase, Laura Blythman custom artwork, Little Letter Lights Co. G marquee light and the la de dah kids crochet unicorn. And who can resist a Japanese Woodland Doll - the 70's classic now remade by one old gentleman who sprays each piece by hand. Love You Big Much Poster: One-off custom-designed by Laura Blythman for my 30th birthday featuring a saying that Georgia uses all the time. I love it to bits! G marquee light: Little Letter Lights Co.
House shadow boxes: I collaborated with Top Knot Designs to create these shadow boxes and they are available now directly from Top Knot Designs. I painted them to suit the space. 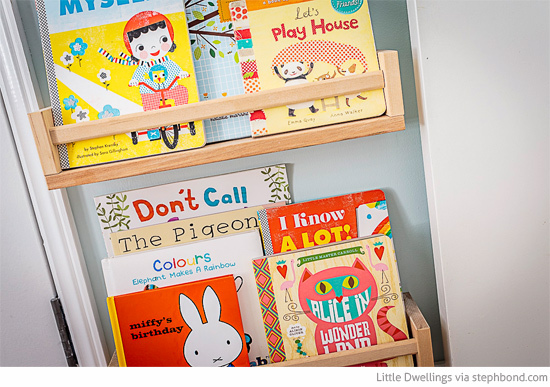 The forward-facing book shelves are a staple now - choose your favourite book covers to display and entice the little ones to read them. 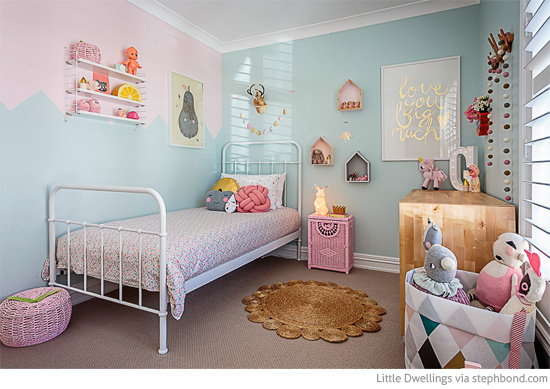 Every little Australian girl's room needs a Laura Blythman artwork - the colours work beautifully with this room. 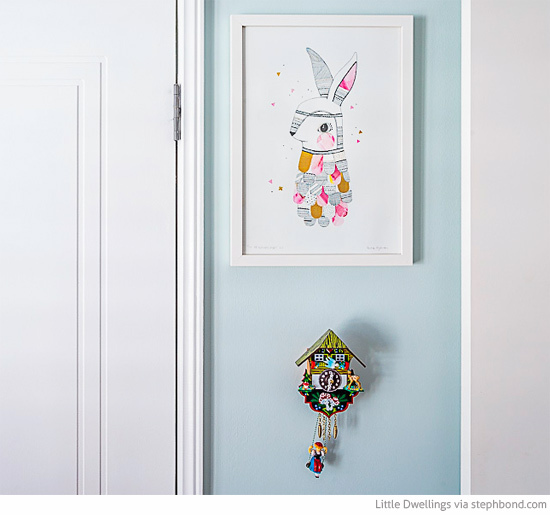 And I absolutely love the addition of the traditional cuckoo clock - my girls would love this! Side table: I found this vintage side table and painted it pink - looks great now! 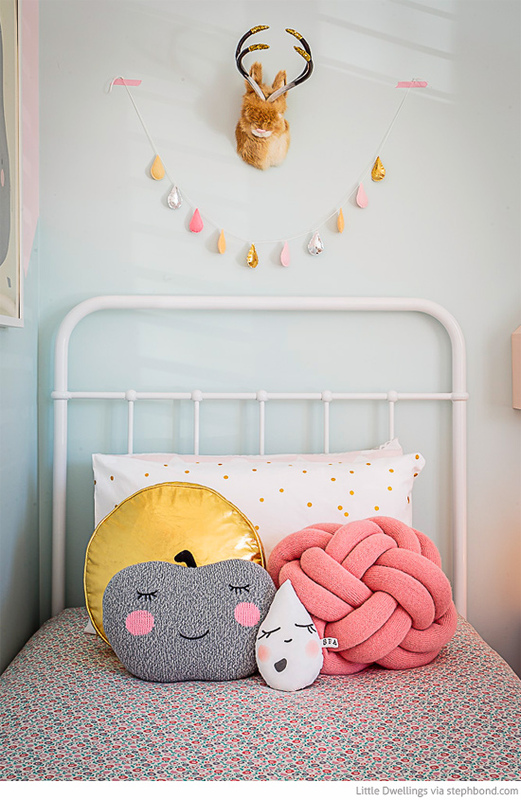 Thank you so much Kate for sharing your daughter's gorgeous room with us. I can't wait to see what all your other clients' rooms will look like! Kate works with clients around the world online and in-person from her Sydney base. 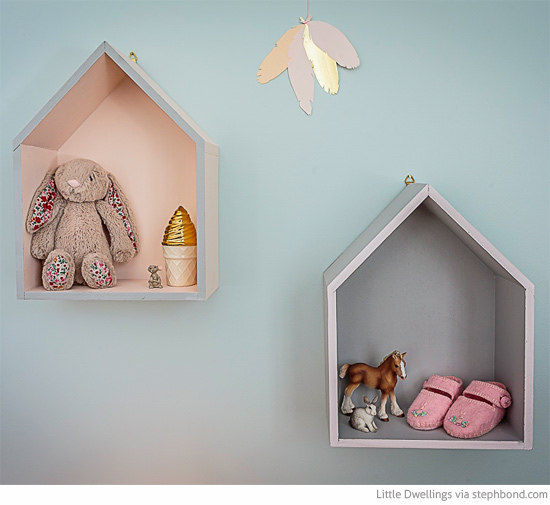 For more images from Georgia's room and more about Kate's interior design business, head to the Little Dwellings website and Instagram feed. Such a lovely room! I may be completely missing it, but I'm looking for the mint paint name, do you happen to know what it is? Thanks! hi how did you make the mountains on the wall ?